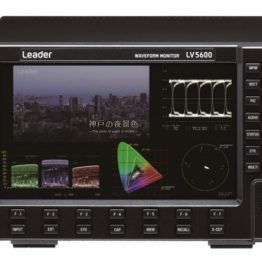 Leader Insturments LV5307 - Fiber Group Inc. 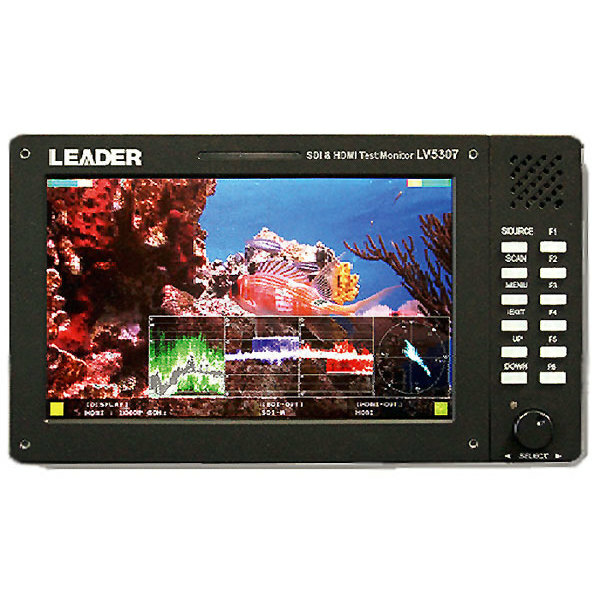 Your perfect monitoring companion for professional video applications, this new monitor from LEADER features a bright 7” built-In LCD display with IPS LED backlit panel. The screen contents, including waveform, vector, false color and markers can be output via HDMI to a larger monitor. Easy to use controls with settable quick function buttons nicely complement the comprehensive display and menus. SDI and HDMI inputs can be cross-converted at the same time. Embedded audio is de-embedded and displayed as 16-channel bar icons on the picture. A built-in speaker allows for quick audio review and headphone outputs are provided; H/V audio delay is also user settable and the volume is front panel adjustable. Picture functions include markers, monochrome, blue-only, red–only and green-only modes; a cross-pulse function is also included. Display color temperature is user-adjustable. Peaking function provides for easy focus setting. RJ-45 control is also included. The instrument is provided with a tilt stand and the AC adaptor is included. Optional rack-mount available. Accepts 3G/HD/SD-SDI, HDMI & Analog Sources. Provides Picture, Inset Waveform, Vector and False Colors display (test screens for SDI & HDMI sources only). Converts & Outputs HDMI to SDI and SDI to HDMI Simultaneously. Built-In XGA IPS LED Backlit Display (1024 x 600) For Superb Picture Representations. Settable Color Temperature & User Settable Adjustments. HDMI Output Can Be Set To Output The Screen Contents To A Larger Monitor (Rasterizer Output Uses HDMI Output). DC Powered; 12 -18 Vdc; AC Adaptor & Tilt Stand Included.